To make it short: I completely failed. Well, not completely completely. 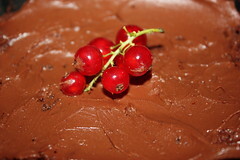 I managed to make the ganache. But the more tarte crusts I make, the worse I get. Usually, I tend to overbake it. Not this time. 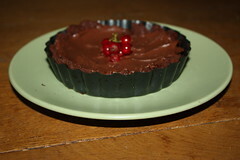 This time I made a wonderful chocolate shortbread crust. The problem was: When I pulled the crust of my small test-piece out of the shell, it completely cracked. Cracked in hundred pieces. So I hurried to re-arrange the pieces and filled in some of the ganache to get at least a picture. With the "real" tarte it was the same problen. No idea what went wrong. I used two medium egg yolks despite one big one, but I think this should add more humidity, not less. So - who knows. Tarte crusts and me just don't become friends. At least you can't tell from the picture how big the fail was. I ate the test piece it with a spoon, and it did taste great. I planned to decorate the tarte with some red currants, for the looks and to get a counterpart to the sweetness of the tarte, and for the little pice the taste-combo did work very well. But there was no sense in filling the the crumbling crust and bringing it to work. So I mixed the chocolate ganache with sugar-water and some yoghurt, added big pieces of the tarte crust and the rest of the un-baked dough and now have Chocolate Half-Baked Sherbet to bring to work tomorrow. There are worse things happenning, I guess :o]. If I make this ever again (and for the taste and looks it is all worth it, it is just the question if I dare to do a tarte crust, without having it on the TWD-list), I would go for orange-dark-chocolate, an idea I got from Karen from Our crazy blessed life, that sounds terrific, as I adore orange-dark chocolate! I'm so sorry you didn't have the outcome you wanted-at any rate, your tart looks delicious! A big piece of mine fell off when I removed it from the pan. I had taken a photo in the pan and I found enough to roughly cut. Na ja, manchmal klapt es einfach nicht. Es ist auch so fur mich. Ich habe viel in diesem "baking group" gelernt. Ich mochte auch die orange-chocolade kombination probieren! Too bad your tart crust fell part but you can't tell by your pictures! It looks delicious! Looks WONDERFUL - despite the crust problems! You'd never know it - and I'm sure that it tasted delicious - which is all that counts! I never got mine out of the pan. The bottom completely stuck. At least it tasted great. I love your save by making sherbert! So sorry for your difficulities. However, you had yummy chocolate wondefulness! I made the regualr short bread crust minus chocolate. 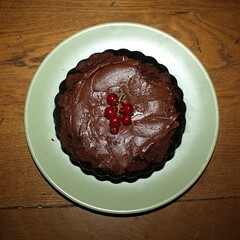 i'm sorry your tart crust didn't work, but i'm so glad that you took the ganache and transformed it into a new dessert. thanks for baking with me!